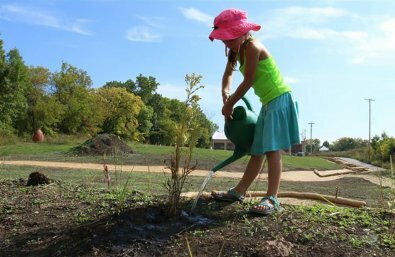 Grant Recipient: Urban Ecology Center, Inc.
Urban Ecology Center ($30,000)The Fund for Lake Michigan is supporting the Urban Ecology Center’s project to convert a 0.4 acre parcel within Riverside Park and the Milwaukee Rotary Centennial Arboretum into an ephemeral pond. This parcel is adjacent to the Milwaukee River and is currently filled with invasive plants and bare soil that collects runoff from a nearby service road. The runoff then pools in this area before running into the Milwaukee River. Creating an ephemeral pond will capture this stormwater runoff from the surrounding acreage and create a habitat for amphibians such as salamanders and frogs. The Urban Ecology Center will also incorporate this pond into its educational programs for children.